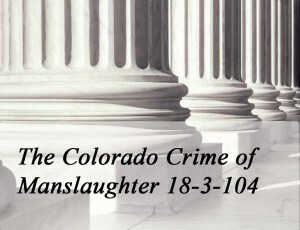 – The Jury Instruction appears after a reprint of the statute defining the crime. (b) Such person intentionally causes or aids another person to commit suicide. (2) Manslaughter is a class 4 felony. (3) This section shall not apply to a person, including a proxy decision-maker as such person is described in section 15-18.5-103, C.R.S., who complies with any advance medical directive in accordance with the provisions of title 15, C.R.S., including a medical durable power of attorney, a living will, or a cardiopulmonary resuscitation (CPR) directive. (a) This section shall not apply to a medical caregiver with prescriptive authority or authority to administer medication who prescribes or administers medication for palliative care to a terminally ill patient with the consent of the terminally ill patient or his or her agent. (I) “Agent” means a person appointed to represent the interests of the terminally ill patient by a medical power of attorney, power of attorney, health care proxy, or any other similar statutory or regular procedure used for designation of such person. (II) “Medical caregiver” means a physician, registered nurse, nurse practitioner, physician assistant, or anesthesiologist assistant licensed by this state. (III) “Palliative care” means medical care and treatment provided by a licensed medical caregiver to a patient with an advanced chronic or terminal illness whose condition may not be responsive to curative treatment and who is, therefore, receiving treatment that relieves pain and suffering and supports the best possible quality of his or her life. (c) Paragraph (a) of this subsection (4) shall not be interpreted to permit a medical caregiver to assist in the suicide of the patient. 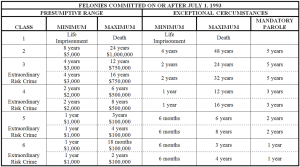 To enlarge this Colorado Felony Sentencing Chart – click on the chart itself.